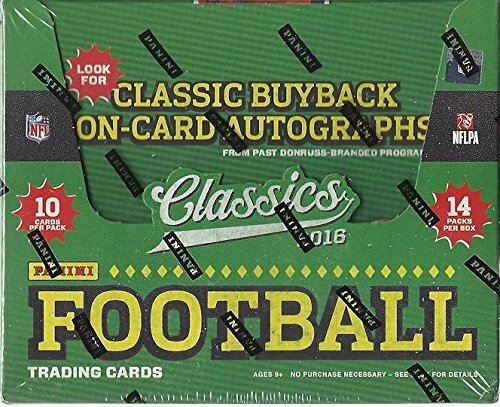 2016 Panini Classics Football Hobby Box - 14 Packs Per Box, 10 Cards Per Pack;RELEASE DATE 05/25/2016 - One On-Card Buyback Autograph PER CASE! Look for One Autograph Per Box, on average! ;Search for one on-card buyback autograph per case, featuring the best and brightest Donruss-branded programs of the past! ;Pull rare Memorabilia cards of the NFL's past and present icons, including Hall of Famers in Canton Collections Swatches! ;Panini Classics returns to the gridiron with tons of iconic content! Look for one autograph per box on a checklist loaded with current and vintage stars!